We’d love your help. Let us know what’s wrong with this preview of Poemcrazy by Susan Goldsmith Wooldridge. To ask other readers questions about Poemcrazy, please sign up. If you are new to poetry and would like to start writing your own poems for fun, but are not sure how to start, this book is for you. This is a great, unintimidating book for all ages. And a great introduction for those who might not have much interest in poetry, in general, because the author has included short, simple, exercises at the end of each chapter that is both creative and fun which ANYONE can try. Even if you are an experienced poet, you might come across tips that could initiate the c If you are new to poetry and would like to start writing your own poems for fun, but are not sure how to start, this book is for you. This is a great, unintimidating book for all ages. And a great introduction for those who might not have much interest in poetry, in general, because the author has included short, simple, exercises at the end of each chapter that is both creative and fun which ANYONE can try. Even if you are an experienced poet, you might come across tips that could initiate the creative process at times when ideas are running dry. In my opinion, this title shines as a first “how to” poetry book for someone that is slightly curious about writing poems, yet is a bit hesitant to start. And this book would be great as a gift to someone that might never have thought of writing poetry before since this book + plus a little encouragement could ignite a lifelong love affair with poetry. I liked this a lot - particularly how accessible Wooldridge makes poetry and word play to everyone. Wooldridge's "word tickets" sounded an awful lot like Magnetic Poetry to me, and based on the original publication date, she was probably writing this around the time the original Magnetic Poetry set was released (but probably before it was widespread). If I had to describe POEMCRAZY in one word, it would be... Alive. Yes. Alive. Every sentence, every paragraph, every page and essay and writing prompt in this book is bursting with life, joy, and spirit. It is so many things - whimsical yet practical, insightful yet exuberant, thoughtful and observant, passionate and inspiring - that calling it "brilliant" or a "gem" or "treasure trove" doesn't suffice. Then again, POEMCRAZY isn't simply a guide on how to write poetry. Nor is it simply a book ab If I had to describe POEMCRAZY in one word, it would be... Alive. Then again, POEMCRAZY isn't simply a guide on how to write poetry. Nor is it simply a book about poets or poetry. Rather, it's a collection of musings and exercises that touch on the art of writing poetry, its many (and sometimes unexpected) wellsprings of inspiration, and the impact it has on how we see and express ourselves and, thus, how we live. Susan Goldsmith Wooldridge shares all kinds of anecdotes from her personal life and teaching experience (she conducts poetry workshops in her home state of California), including how her own children are part of her poetry process and how her wide range of students (from elementary school students to prison inmates) have revealed the deepest parts of themselves through their work. Did I mention how incredible Wooldridge's prose is? It's so vivid and graceful and sprightly, as if someone translated a ballet dancer's movements into words. It exudes alertness, imagination, and a sort of reckless abandon that speaks to the writer's soul and beckons them to come out to play. So when I say that POEMCRAZY is alive, I mean it not only in terms of the topics it covers, but also in its approach and personality. This book is amazing! The key turned in the door of my mind and I am free to write with a playful heart and mind. This book will have a permanent place on my shelf and in my mind! If you want to free your creative self, unlock the poet within this is the book for you! Fall in love with the world through the magic of words, words, and more words! This book and the exercises within are a sheer pleasure! 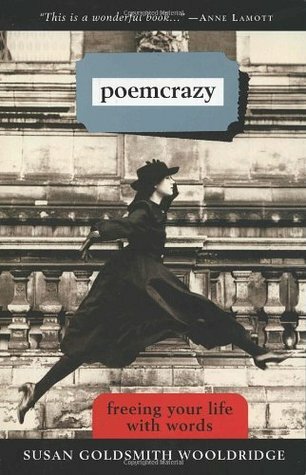 I bought poemcrazy at Borders (Remember Borders Books? Sigh.) when my oldest daughter entered Bennington College in 1996. Poetry was one of her areas of study (I think it was her original major), and I thought she would like it. But as I flipped through it, I decided I’d read it first, then send it to her. I started reading it often, always meaning to try out the exercises, but never getting around to it. Meanwhile, Carly changed majors several times, graduated from Bennington with a degree in Ge I bought poemcrazy at Borders (Remember Borders Books? Sigh.) when my oldest daughter entered Bennington College in 1996. Poetry was one of her areas of study (I think it was her original major), and I thought she would like it. But as I flipped through it, I decided I’d read it first, then send it to her. I started reading it often, always meaning to try out the exercises, but never getting around to it. Meanwhile, Carly changed majors several times, graduated from Bennington with a degree in German, then got a Masters from NYU in English as a second language, earned a second Masters from Baruch College, and started doctoral work. I’ve never sent her the book. Finally, last January I began a year-long love affair with poemcrazy: freeing your life with words, by Susan Goldsmith Wooldridge, which has resulted in twenty-seven babies (poems) so far. Poemcrazy is an informal textbook on creating free verse. Wooldridge is a nationally known teacher of poetry workshops to students of all ages. She is more interested in playing with words to release their emotional content than in adhering to strict form or rhyme constraints. Wooldridge advocates collecting words in a wordpool. She likes writing individual words on tickets, like those used at carnivals. Throughout the book, Wooldridge makes suggestions for additions to the pool. I write my words on quartered 3×5 cards, color coded: blue for adjectives, yellow for verbs, orange for nouns, green for colors, and pink for feelings. I rubberband each color together and store them in a Ziplock baggie in my desk drawer. The wordpool can be used to generate poems. For me, one or two cards drawn from each category create weird juxtapositions that ignite bizarre images and bring long-repressed memories back into my consciousness, releasing floodgates of emotion—a perfect breeding ground for poetry. "…Erica [a high school student] stared at a perfect, round dandelion gone to seed. When Stacie knocked some seeds, off, Erica went outside for another. She wanted a perfect sphere. I asked her to look closely, name it and then describe what the dandelion looked like, reminding her that close observation is important in poetry. "Then I asked her to think about a quality of the dandelion that could enrich her life. I felt discouraged and I was pushing her. I asked her to begin, What does it look like? What does it look like that it isn’t? When Erica finally wrote about her dandelion, I was reminded of the power of comparison (or simile and metaphor) to expand our sense of possibility in ourselves and in everyday objects. or even a golf ball on a green tee. with small people growing out. An octopus tarred and feathered. it flew by so fast. the firmness and strength of a rock." Before I read this book, I didn’t think I could write poetry. Poemcrazy was first released in 1996. It is now in its twenty-sixth printing. I had concerns about some of the many references to indigenous American people’s beliefs. Wooldridge talks about going to an Art of the Wild conference at "Squaw Valley." Squaw is an really offensive term. I guess it's not the author's fault if the valley is called Squaw Valley, but it still made me cringe. This is because in other places Wooldridge says things like, "Native wisdom holds that the soul or spirit takes that long to leave [the body] fully" (loc 1290), and this is such a generic, sweeping, New Agey term. Which of the 566 federally recognized tribes is Woolridge talking about? The whole way through there's a sense of fetishization of indigenous American cultures. Wooldridge has a "middle-class, Chicago Jewish background" (loc. 1199) and then she talks (a lot: 30x references) about the coyote as a guiding spirit: "To the American Indians, coyote is tricky, magical and often a hero in spite of himself" (loc 1201). She gives a related poem prompt: "Begin your poem with one of these openers, Coyote and I, or, I am Coyote, Coyote made me. Include the moon. And, sure. Go outside and howl." See, in New Zealand this would lean toward cultural appropriation, unless you personally had a connection to coyote. You can’t just borrow important Maori symbols and write about them, piggybacking on their cultural meaning. I mean, you can, but it would be really, really ill-advised. And rude. It’s not okay to pick and choose, selecting the parts of a culture you want, without embracing the context in which those aspects arise. So, yeah, the whole way through, whenever Wooldridge used indigenous American culture in her discussion, I felt uber uncomfortable. Your milage may vary. I'm not really a poetry person. Sure, I like reading some of it. (Operative word: some) But I've always felt slightly ridiculous when teachers assigned the writing of poetry in school. I've felt completely ridiculous the few times I've voluntarily tried my hand at it, the same feeling I imagine someone who is tone-deaf and can't read music must get when confronted with a piano or a karaoke machine. I'm a process-driven, analytical, left-brained introvert. What some see as creative syntax, I see I'm not really a poetry person. Sure, I like reading some of it. (Operative word: some) But I've always felt slightly ridiculous when teachers assigned the writing of poetry in school. I've felt completely ridiculous the few times I've voluntarily tried my hand at it, the same feeling I imagine someone who is tone-deaf and can't read music must get when confronted with a piano or a karaoke machine. I'm a process-driven, analytical, left-brained introvert. What some see as creative syntax, I see as mangling the language. Comparing intangibles to random nouns confuses me. Emoting all over the page makes me squirm, whether I'm the one attempting the emoting or it is someone else. That's probably why it's good for me to read something like this book once in a while. It reminds me there are other ways of seeing and being. Local writer writes about "freeing your life with words." *two snaps in a zig-zag* LOVE HER! I was wonderfully blessed to attend a free poetry-writing workshop taught by Susan G. Wooldridge at the public library in Oroville, CA in April 2011. Gods, how I love this woman and her Poemcrazy book! If I had to name one person who has had the biggest impact on my writing, it would be Wooldridge. This book is a must if you write and are seeking inspiration. Several good ideas in this book for writers. The author had a worldview unlike mine. She sees poetry as a way to discover and express a truth which comes from oneself. I understand poetry as a way to see and understand what is propositionally true outside oneself. The chapter on controlled abandon was my favorite and a few of the practice ideas are good. One of my very favorite books. It's definitely a keeper if you're a writer - I hated giving mine away, but it was a book that needed to be passed on. I will get another one for my collection. That's how much I loved this book. This wasn't full of great prompts or theory or anything (compared, for example, to "In the Palm of Your Hand"), but I found this book really touching in its way, and inspiring. She writes as if she's having a conversation with the reader, and she provides some excellent example poems. I read this book slowly, one or two of its small chapters each morning while I drank my first cup of tea. This book is about celebrating life in all its hugeness and ordinariness through words and imagination. I loved it. great book to spark creativity for writing. I read somewhere once “to write better read poetry” something like that and have done exactly that. This book gives some awesome practices to help ignite that side of you... keeping this with me everywhere I go. Susan took the time to write me a postcard, which I have stapled inside the book. "Be sloppy. Steal words. Carry a journal." and tells us stories about her life with words. wonder of words and poems. Straightforward, 'Poemcrazy' is a passionate rallying call to get the poet out of you. In fact, the whole book ultimately gets down to only one piece of advice: if you want to write poetry, then get yourself a pen and notebook and, go jot down the world around you in all its 'ordinary magic' (an expression the author acknowledgingly stole from Alan Ginsberg). That's it but gosh! How enthusiastic she is! Her heartfelt passion and consuming drive is actually what makes it all a worthy read. Readin Straightforward, 'Poemcrazy' is a passionate rallying call to get the poet out of you. In fact, the whole book ultimately gets down to only one piece of advice: if you want to write poetry, then get yourself a pen and notebook and, go jot down the world around you in all its 'ordinary magic' (an expression the author acknowledgingly stole from Alan Ginsberg). Yet, this book is quite easy to dismiss. Here's just encouragements and prompts with absolutely nothing on technique and prosody. It's quite repetitive. She clearly gets carried away towards the end. Her wild enthusiasm may also seem plain silly or annoying at times, although contagious (see how she writes about e. e. cummings or Walt Withman). Hence, it certainly is not a necessary read. Having said that, I still think it's a pleasant book to go through not least because, on a strictly personal level, some of her points particularly resonated with me. All in all then, even if there's nothing at all on the technical side of the craft, once you forgive her for stating the obvious and leave aside her at time over the top enthusiasm here's a very friendly and passionate invite into the realm of poetry. It's just that, but it does it very well. Fun poetry craft book. I will review soon. This is one of those writing guides where every exercise or tidbit of advice is paired with a story. Even the most bland remembrances suddenly become fodder for writing, even I know that as a writer, but it doesn't mean I want a writing guide made up of them. I was hoping for something with a bit more teeth. p.xii – Poems arrive. They hide in feelings and images, in weeds and delivery vans, daring us to notice and give them form with our words. They take us to an invisible world where light and dark, inside and outside meet. p.7- Buy yourself a notebook / journal that suits your personality and keep it with you, at least while you’re reading this book. In a journal you can be self-centered and feel safe enough to write poems. It’s never too late to start. Don’t try to catch up by going back in your life. Start with now. p.10 – A word can trigger or inspire a poem, and words in a stack or thin list can make up poems. Because I always carry my journal with me, I’m likely to jot down words on trains, in the car, at boring meetings (where I appear to be taking notes), on hikes and in bed. p.27 – Once I heard poet Gary Snyder say, “Poetry has an interesting function. It helps people be where they are.” It’s hard to write a poem about a place, an experience or even a state of mind without fully being there. This book has helped me to remember the small things I'd forgotten about why I love writing poetry. It's given me some useful practices and tools for future "stuck" moments. I also love the whimsical attitude taken by Ms. Wooldridge. Her emphasis on being in and writing in the present is something I often struggle with. The way this author describes writing poetry and playing with words makes me remember my love for the craft and inspires me to do more with the words in my head. Fantastic read- This book has helped me to remember the small things I'd forgotten about why I love writing poetry. It's given me some useful practices and tools for future "stuck" moments. Generally, this poem is about a teacher named Susan Wooldridge. Who, in case you haven’t noticed, had fallen in love with the art of poetry. She lives her life writing and being influenced by poetry as she describes every personal thought and feeling. This is the perfect book for learning how to express yourself and figuring out how to write poems. Not to forget, you’ll learn how to get your ideas to get started. Honestly, what really confused me at first was whether the series of events told oc Generally, this poem is about a teacher named Susan Wooldridge. Who, in case you haven’t noticed, had fallen in love with the art of poetry. She lives her life writing and being influenced by poetry as she describes every personal thought and feeling. This is the perfect book for learning how to express yourself and figuring out how to write poems. Not to forget, you’ll learn how to get your ideas to get started. I bought this book because I love the cover.I have read many books about writing and the creative process, yet few have reached me the way Poemcrazy has. Woolridge's love of life and words sings out from every page. Her writing is alive and enthusiastic, and her practice suggestions are stimulating. She gives enough detail, guidance and encouragement that it is easy to start writing. Her enthusiasm is contagious;where many books portray writing practice as a dreaded but necessary chore, Woolridg I bought this book because I love the cover.I have read many books about writing and the creative process, yet few have reached me the way Poemcrazy has. Woolridge's love of life and words sings out from every page. Her writing is alive and enthusiastic, and her practice suggestions are stimulating. She gives enough detail, guidance and encouragement that it is easy to start writing. I love this book. Love it because it stretches your mind to play, dream and fall in love all over again with words. Woolridge shares with us her tips and techniques and ideas on how to shift everything we see into living poetry. There are playfyul exercises, simple ones you can expand on or save for later, yes perfect for a classroom, homeschoolers, or any person who wants to delve into the wonderful world of poetry. I have read this book five times and each time I receive something more than the first time. I recently read it again on my eight hour Amtrak ride home from New Jersey. This book inspires poets to write, and write deeply from the heart. Her words hit me and inspired me to write more and more poetry. Don't miss this one! I really enjoyed this. She gave a lot of ideas on where to write and how to tap in to your creative side and how to make poetry about even the things you view has mundane. I would have liked to have more straight forward prompts but I did enjoy the ones that stood out to me and even tried some of her ideas in my classroom. This book has inspired me to write poetry even though I am not a poet. I liked the essays interspersed in the practical applications for writing. In fact, I liked the essays more than the poems or the ideas. Several ideas for teaching were interesting, though, and would be useful in classrooms. I like some of the ideas in this book - having a bowl of words to use as prompts - but I am not that fond of the author's ultra-breezy style. This is an incredible little tool. I have filled several journals in the process of reading and rereading this book. Warm and encouraging with just enough truth and grit and anecdotes to inspire even the most reluctant writers to pick up a pen and tell their story.